Winter Park’s snowy mountain tops make a great backdrop for that dreamy holiday vacation you’ve been looking for. 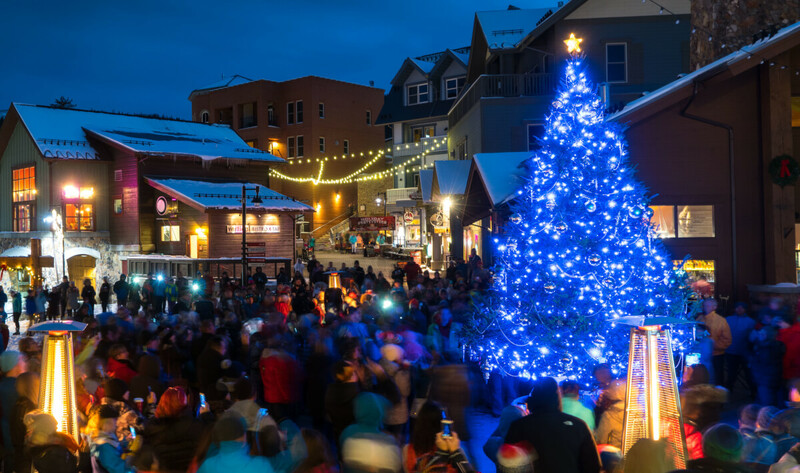 Whether you’re looking for some Hallmark-worthy romance with your significant other, a memory-making Christmas with the family or a holiday chock-full of adventure, Winter Park offers a holiday experience all December long! Here’s a guide to some of the must-do activities that will make any Grinch’s heart grow three sizes. Nothing is more iconic than the Winter Park Torchlight Parade! With a bonfire at the base of the mountain and old-fashioned Carolers kicking off Christmas Eve at the base of the mountain, there’s something magical about the whole evening. Once the parade starts, the mountain will glow with flares, Santa will follow down before the fireworks display. The holiday spirit in the air is magical! Following the parade, you can ride a gondola up to Sunspot Mountaintop Lodge for Christmas Eve dinner. *Pro-tip: Book a reservation for Sunspot’s moonlit gondola and mountaintop dinner for the Friday or Saturday before or after Christmas, and enjoy the experience without having to navigate the crowds. Let us do the cooking (and the dishes) while you enjoy a Christmas Eve dinner spent with friends and family. There’s no need to spend all day in the kitchen when you can spend it on the ski hill! Doc’s Roadhouse is serving up a pre-holiday feast perfect to fill your belly after a day on the slopes. Reservations start at 6 pm, directly after the Torchlight Parade. We know you’ll work up an appetite, so go ahead and give yourself an early Christmas present. You deserve a night out! Dash through the snow on a one-horse open sleigh! Sombrero Stables offers daytime rides that end at an outdoor bonfire or opt for an evening ride and hope for clear, crisp skies to star gaze as you glide across the snow glades to a Colorado dinner with a glass of wine in hand. After a few runs on the Coca-Cola Tubing Hill, there’s nothing like warming up with the best hot chocolate in town! Hill House has a variety of specialty cocoa drinks that bring the holidays right to your taste buds. Watch the other riders take on the four lanes of tubing fun on the indoor screens while you cozy up with a cup of warm delight. Snow starts to gently fall, the windows of your vacation rental start to frost, and the smell of fresh baked cookies starts rising from the oven. As the cookies start cooling, call the kids over to help set up the frosting and toppings. After you’ve decorated Santas, ornaments, and reindeer enjoy your delicious creations while sitting on the hearth of the fireplace. Even though this is a busy time of year for Mr. Clause, he still makes time to visit the Winter Park Resort Village on the Saturday and Sunday before Christmas. He also makes a visit Christmas Eve, to read The Night Before Christmas before he starts the evening deliveries. A Classic Colorado Christmas wouldn’t be complete without a little tree hunt. Big and full, tall and narrow, or Charlie Brown Style, find a tree that is perfect for you with a unique mountain experience. Find details about getting a permit, with your lodging reservation here. We love live music and drinks on any day, but there’s something magical about New Year’s Eve. Boogie the night away with a mix of sprightly cocktails, delicious food, and good tunes. Catch live music from 9pm to 1am featuring the Kenny Lee Young Band—a local favorite—at Vertical Bistro right here in the Village at Winter Park Resort. Nothing like starting the new year Winter Park-style. A button nose and two eyes made out of coal! Style your own personal frosty! The kids will love the extra play time, plus when you add in the snow, they’ll have a blast with this winter classic. Parents will feel nostalgic helping kids roll the pieces of their snowy creation. Then snap some photos of the fun, with the mountainscape in the background. Devil’s Thumb Ranch not only offers World Class Cross Country Skiing and an exceptional spa experience, it also has the beautiful Heck’s Tavern for culinary delights and an exceptional dining experience. The Prime Rib Buffet offers a beautiful backdrop for Christmas Day, as well as puts you in close proximity to another outdoor playground. Explore 120 km of cross-country trails in the pristine valley of the Continental Divide. Skiing and Snowboarding at Winter Park Resort is the just the start of the holiday fun in the area. Fill your December with Colorado memories and start planning your adventures.